Home Sheducation Centre Is it Time to Replace Your Old Stables? Is it Time to Replace Your Old Stables? At Action Sheds Australia, stables and farm sheds are a large part of our business. We carry Durastall Stables, which we feel provide the best combination of quality, durability, and price in the industry. Durastall Stables are made from their proprietary, 100% hot dipped, galvanised steel. This not only provides superior rust protection, but is among the strongest and most dependable steel in the industry. The stables can be installed freestanding within a current building, or we can build a shed or barn for you, and then integrate the stables into it. The stables are available in kit form, or we will be happy to install them for you. As a ShedSafe accredited dealer and builder, we specialise in providing sturdy sheds and stables that are built to withstand the climate and weather of their particular location. If you decide to install your stables within an existing building, we can ship them in kit form or we can install them for you very quickly. However, if you require a farm shed or barn to go with them, it will take a little longer. We will consult with you and develop the perfect custom building for your needs. Our farm sheds have a 10 year warranty on the structural beams, while the cladding is guaranteed for 15 years. We can provide virtually any size of shed that you need, custom built to your specifications. If you decide to put your stables in a barn, we provide both Australian and American designs. The Australian barns can be customised with features such as internal walls, mezzanine floors, personal access doors, awnings, or extra roller doors. 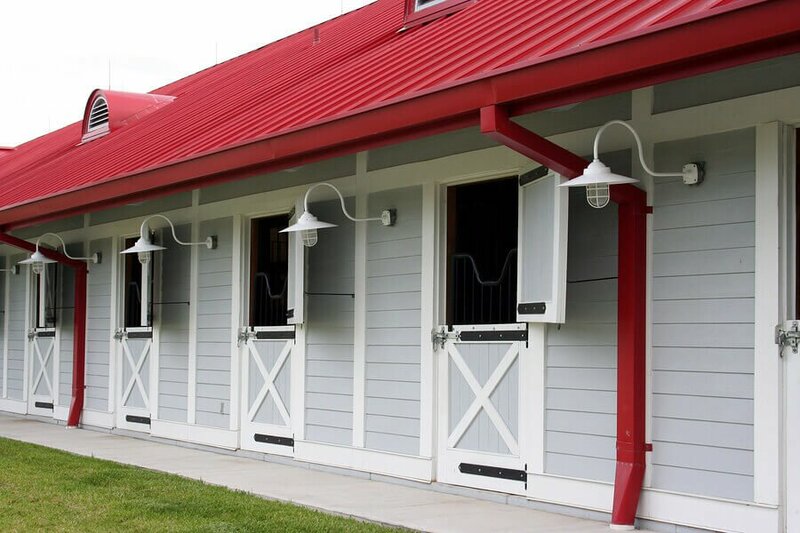 American barns can be designed with 7.5° awnings on either side with a 25° high centre. Their design lends itself naturally to creating a stable complex, due to the high and wide centre breezeway. Options such as the mezzanine floor are also available on the American barn design. The materials on either barn carry the same warranty as those on the farm sheds, and we can custom build them to your specifications, including length, width, and height. Call us today at 1300 778 628 for a competitive quote based on your requirements.